Adorn Shop: Find the perfect Clutch / Handbag accessory in Swarovski crystal and leather and gold for your special occasion! Swarovski crytal and leather clutches are a girl’s best friend for any event. 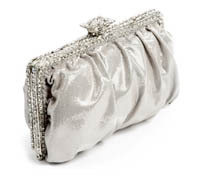 Discover the perfect Clutch or Handbag for any special occasion or wedding right here. Items for this category are coming soon! If you are looking for something specific, we can most likely get something for you sooner. Click here to contact us with your request.